Are you a "TEAM PLAYER? We need Team Players, people who like to actually ride their motorcycles. Because RIDING motorcycles is what it's really all about, Right? In Rose City Motorcycle Club (RCMC), actually RIDING MOTORCYCLES is where we place our emphasis. You can see this attitude in the events RCMC hosts for the motorcycling community each riding season. You will NEVER be required to sit and "drone" through a business meeting. RCMC has a Board of Directors and that's their job. The rest of the members attend the monthly Breakfast Socials and concentrate on riding. RCMC traces its historical roots back to 1911. We have a very strong motorcycling hertiage that lives on today in all of us. We need people that believe, as we do, that Rose City Motorcycle Club and its events represent something important to motorcycling. Something we that want to see continued. And that takes people who really are full-time motorcyclists at heart. Are you? Join us and be a part of RCMC. To become a member, RCMC incourages, but not requires, you be a current member of the American Motorcyclist Association (AMA). With a bankcard you can join today by calling: 1-800-AMA-JOIN. For a more personal touch, you can join AMA at any of our monthly Breakfast Socials or contact one of our Directors. Annual Dues in RCMC are $30.00 per year. After the parents have joined, Junior Memberships (age 17 and under) are free. There are many member benefits including our newsletter "The Ramblin' Rose", Club insignia (Hats, Jackets, Vests, etc.) free Grand Tour passport book annually, in-club functions, rides, and much more. RCMC members are ineligible to compete for any trophies or prizes of the day at events owned and operated by RCMC. To do otherwise, we believe is a conflict of interest. And whether or not there is any "real" impropriety, we believe that it tends to create the perception of impropriety. So we just don't do it. Being a member of RCMC has numerous and significant benefits. Riding enthusiasts may choose to attend our events as a paid entrant, or choose to be a member of RCMC. Remember you can never be both at the same time. And which ever you choose, we warmly welcome you as enthusiasts that love motorcycling! 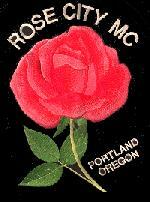 We appreciate your interest in Rose City Motorcycle Club.